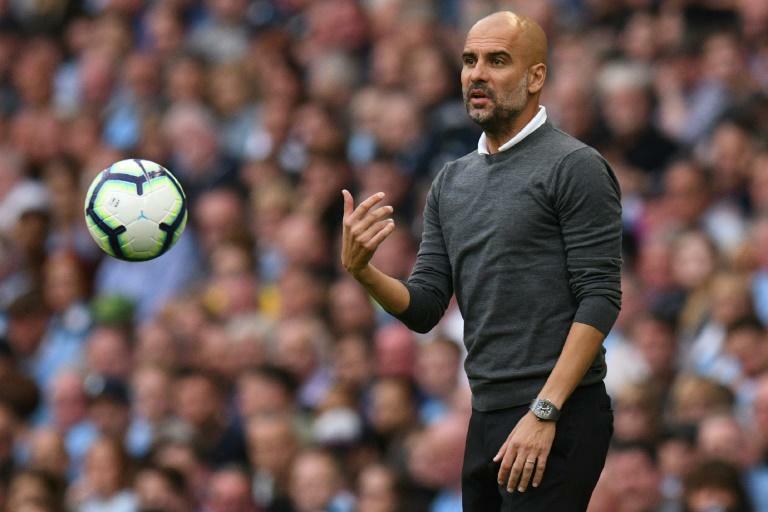 Pep Guardiola insists he remains happy with Leroy Sane's attitude despite leaving the forward out of his Manchester City squad for Saturday's 2-1 victory over Newcastle. Sane has endured a testing few months since winning the PFA Young Player of the Year award in April, having been left out of Germany's World Cup squad and he has failed to make the starting line-up for any of City's opening four Premier League games. It has been widely reported that Guardiola has been unhappy with Sane's application in training, yet the City manager is unwilling to criticise the player in public. Instead, he suggested that Sane was omitted solely because he has so many other attacking options. Asked if he was happy with Sane's attitude, Guardiola said simply: "Yeah." Guardiola compared Sane's omission from his squad to that of teenage midfielder Phil Foden for last Saturday's 1-1 draw at Wolves. "In the last game, Phil Foden was not in the squad. I was so sad for Phil, I'm so sad for Leroy now but we have a squad. Sometimes I have to leave players out," Guardiola said. "We have six strikers and I decide to play with two strikers. We have two wingers plus another one on the bench. "That's why we decided this game: Don't be there (in the squad), try to work hard again and in the next games he will be ready to play." Guardiola's squad has been weakened by the knee injury to midfielder Kevin De Bruyne, who will be out until late November. He still has a wealth of attacking talent to choose from, but the fact that Sane has played so little football this season remains a surprise. Guardiola claimed he has had no problems with Sane's performances when he has been called on as a substitute for City this season. His most recent appearance was a 13-minute cameo at Wolves. "He played 10-12 minutes, he tried," Guardiola said. "He was not precise but he tried. They know me. They (must) convince me. "I am satisfied the moment they run and they do everything. Mistakes on the ball and taking decisions are part of the process. It's no problem." City have 10 points from their opening four matches, having beaten Newcastle with goals from Raheem Sterling, making his 100th Premier League appearance, and Kyle Walker, scoring for the first time since November 2015. "Raheem made a fantastic goal and he fought a lot," Guardiola said. "Especially in the second half, he played so cleverly. He moved the way we needed to move to help the team to be stable. "The wingers are so important, to make stability in our team, and he did it quite well." Newcastle, who were level at half-time thanks to US international DeAndre Yedlin's first Premier League goal, have just one point after four league matches. But manager Rafa Benitez saw reason for encouragement at the end of a testing two weeks. Benitez's relationship with owner Mike Ashley continues to fester, with the manager unhappy at a lack of investment in his squad. The build-up to the City game was also overshadowed by reports of a training ground row between captain Jamaal Lascelles and Matt Ritchie that required the two players to be separated. Newcastle went into the match on the back of an embarrassing League Cup defeat by Championship side Nottingham Forest, but the Spaniard thought this display was much better. "In the end, I'm disappointed, because we wanted to get the result. But the team effort was there," Benitez said.